The gold market did not see an attempt to reach the psychologically important $1,700 mark yesterday as investors moved into riskier assets following some good news on the global economy. The precious metal lost $17.3 to end at $1,666.7 and is now, by and large, at the same levels seen during mid-December last year. Despite a larger-than-expected build in weekly crude oil inventories, the price of US crude oil posted a $0.44 climb to $95.90. This was a welcome rebound after the previous day's sell off, although only part of the losses were recouped, and was based on signs of recovery in the US and China, both displaying strong economic results lately. Gold closed at $1,684.1 yesterday, slipping from the one month high it reached earlier in the week. This morning it is inching lower as the global recovery has made riskier assets more attractive and so money is pouring into equities and taking the safe haven shine off the precious metal. Spread betting investors are also being cautious as they wait for next week's Fed meeting to discuss future monetary policy. Many commentators seem to feel that as long as there isn't too much tightening, gold isn't likely to fall much in the short-term. Concerns about a potential glut at the Cushing, Oklahoma delivery point, given the limited capacity of the Seaway pipeline, triggered a steep sell off in crude oil yesterday. Meanwhile, the International Monetary Fund cut the global economic growth forecast which also sent energy investors to the exit. Consequently, the price of US crude oil fell by $1.13 to $95.52. Demand for gold increased yesterday as Japan raised its inflation target to 2% and threw caution out of the window regarding its already massive debt by restarting the printing press. As such, the precious metal moved $2.2 higher to $1,691.4 and if anything that could be considered to be a surprisingly light gain. The global economic outlook has improved lately as the US averted the fiscal cliff, Japan joined the stimulus ranks and German investor confidence climbed steeply in the latest figures. As a result, it was somewhat expected to see US crude oil prices posting a rally, $0.85 to $96.67, on hopes of better days ahead for the world's economic growth. In commodities spread trading, the gold market remains in a short-term buying mood and we are approaching the $1,700 level once again. Bulls may seem to have control for the moment, but clients should be aware that the precious metal has become a bit flighty in recent months. We have seen both falls and rallies appear out of nowhere and then disappear as fast as they came. Gold analysis points towards solid resistance from current levels up to $1,697 and then up at $1,705/07. On the downside, support is at $1,683/85 and then $1,672/74, but it must be said that there are minor support levels all the way down to $1,540. 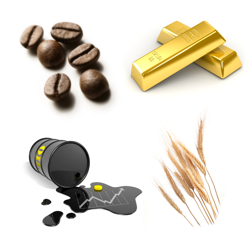 In commodities trading, a lower dollar supported the precious metals yesterday, with stimulus packages on both sides of the Atlantic still on the table. Gold prices advanced $6.4 to $1,686.8 ahead of the Chinese economic figures which have since shown that higher growth has resumed. However, with additional Chinese stimulus now possibly under revision, the reaction in gold market has been muted so far. An improved outlook for the US economy, as presented by the housing and employment data, sparked a rally in crude prices as demand for energy is expected to go up. In addition, events in Algeria, where hostages have been taken at a gas complex, accentuated the climb as the North African country is also an oil supplier. As a result, the WTI crude prices reached another recent high, closing $1.20 higher at $95.80. Gold prices finished nearly flat around $1,679.4 yesterday, as the solid resistance at $1,680 did its job. Bullish investors will want another attempt at breaking out of the sideways range but will be aware that repetitive failures could attract selling pressure towards the $1,640 level. A surprise drop in weekly US oil inventories pushed the price of WTI crude up by $0.73 yesterday to $94.14 a barrel. The effect of the inventories report was so strong that the move even came despite a rebound in the US dollar and a slight pullback in equities. Overnight though, oil prices have been on the defensive as renewed concerns over global growth, with Europe again the main culprit, have taken their toll on the energy markets. With the economic growth forecast being negatively readjusted by the World Bank, investors are now speculating that a stimulus cut could be premature. That bodes well for gold as a store of value, and the precious metal gained $11.8 to $1,679.3 yesterday. Gold analysis suggests that the $1,680 level has been a resistance level since mid-December so bulls will want to quickly break through and push for a more meaningful rebound. The price of WTI crude oil tumbled $0.76 to $93.40 yesterday, on the back of expectations for a build in oil inventories and amid a cut in World Bank growth forecasts. A stronger dollar also encouraged investors to go short of crude oil. Later today, the US Department of Energy will release its weekly stockpiles report, confirming or discarding the earlier concerns. The gold spread betting market closed slightly higher at $1,667.6 yesterday as the President of the Chicago Federal Reserve said that the US will continue with monetary easing measures in the future. This made investors happy as demand for gold as a hedge against inflation usually increases during times of loose monetary policy. Ongoing signs of recovery in the US economy have kept oil prices well supported lately, with Nymex climbing $0.46 yesterday to $94.18 a barrel. Cold weather on the US East Coast and expectations of good retail sales figures due later today also had a positive influence. Gold dropped $11.5 to $1,662.5 on Friday, but is rising on the back of a stronger euro. Physical buying from China is adding to the gains, although Chinese policy makers are rumoured to be cutting back on future monetary easing measures to attempt to keep inflation at bay. Expectations of monetary easing in Japan have also lent support, whilst the dollar being at its lowest level since the beginning of the year has made commodities more attractive. WTI crude oil saw some light profit taking on Friday, as prices dropped $0.19 to $93.63, but the market still ended the week on a positive note. This may have been caused by the re-opening of an oil pipeline that could reduce a glut in the US. From a crude oil analysis point of view, the market remains above all the short-term moving averages.